A bug well tracked is a bug sabotaged. Codes, however well written, are rarely free of bugs. When not discovered and busted in time, bugs can wreak havoc on the entire program, and eventually cause the product to crash. 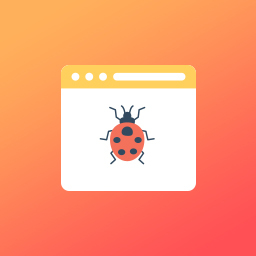 With features like instant notifications and informative reports, the Bug Tracker app lets testers submit bugs as they see them, tail them, and eventually bust them. Two heads are always better than one. Round up a team by inviting more testers to access the app, and submit and track bugs more efficiently. Give your team members permission to assign bugs, either to themselves or to others in the team. This way, you can distribute the bugs among your team and get them squashed as quickly as possible. Receive real-time updates on bug entries and fixes, with email notifications that are automatically sent to your team. Make tracking more systematic by setting milestones. Once the codes within one milestone have been wiped clean of bugs, you can go over the next milestone. This way, you can make sure no bug escapes your clutches, and churn out quality products. Prevent bugs from recurring by recording the steps that went into finding them in the first place. Developers can refer to these steps to learn where they went wrong, and develop builds that are bug-free. Stay updated in real time. 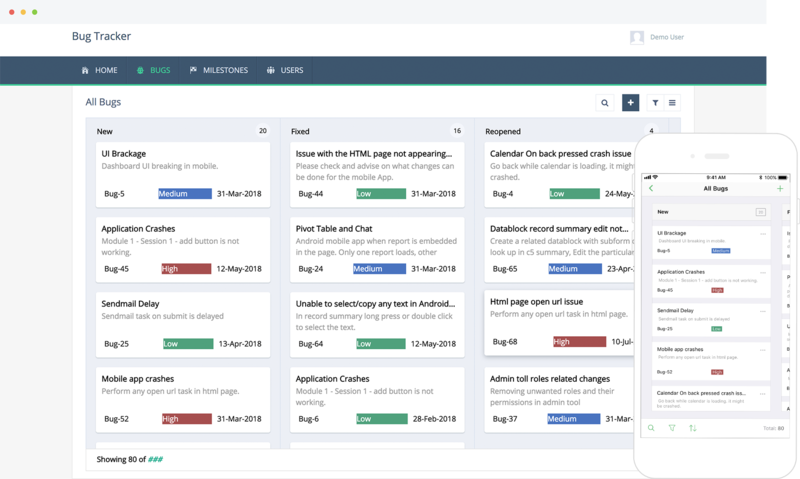 Track bug status with detailed dashboards that display open issues, bug fixes, and builds that are in review. Routinely monitor product quality with reports on the number of bugs that have been submitted per month and milestone. Fine-tune the app to your needs. 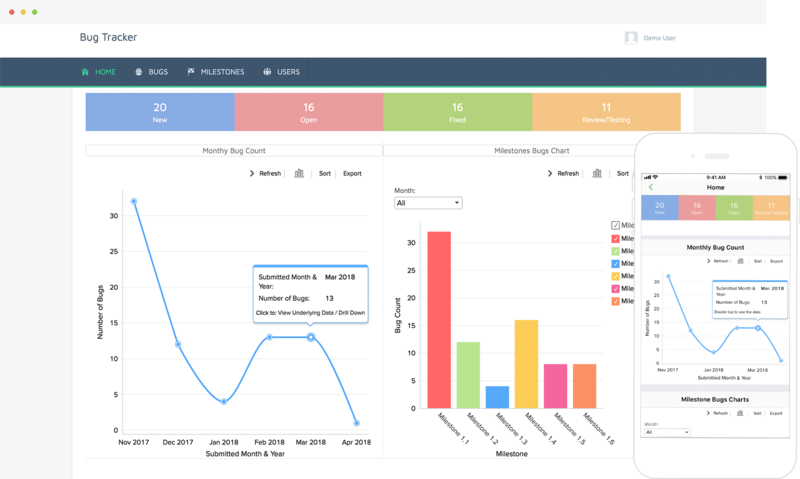 Generate reports based on multiple criteria, create user profiles, add workflows, and more. The app is supported on all web and mobile platforms, so you can file and track bugs on the go. 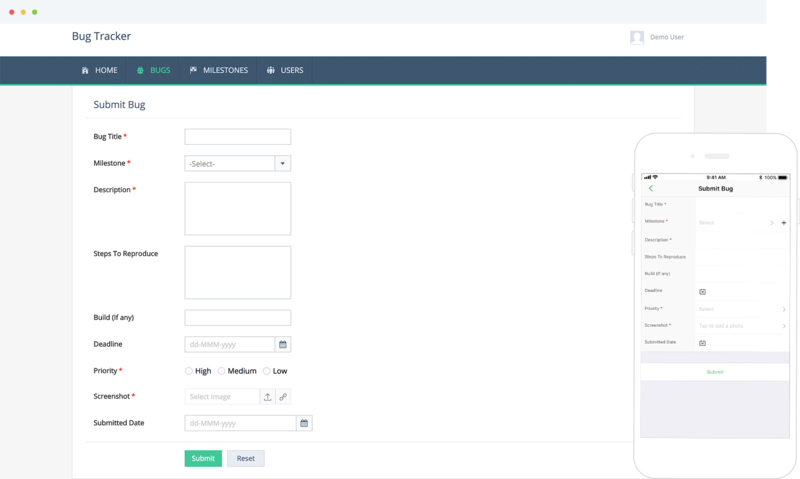 All Zoho Creator apps are tightly integrated with other Zoho products, like CRM, to cover all your auxiliary needs. You can use Zapier to easily integrate this app with your existing software, or with third-party apps like Excel and Google Suite. Install, customize, and make it yours.